By Keith Cowing on September 20, 2012 2:10 PM. "Describing the bill, Chairman Hall said, "This bill seeks to eliminate any further ambiguity about Apollo-era artifacts that were received by the astronauts. It simply says that astronauts who flew through the end of the Apollo program will be granted full right of ownership of any artifacts received from their missions." House Passes Bill to Clarify Astronaut Ownership of Mementos from Apollo-Era Space Missions\n\n\"Describing the bill, Chairman Hall said, \"This bill seeks to eliminate any further ambiguity about Apollo-era artifacts that were received by the astronauts. It simply says that astronauts who flew through the end of the Apollo program will be granted full right of ownership of any artifacts received from their missions.\"\n\n- Congress Deals With Space Artifacts and Moon Rocks, earlier post\n\n- NASA's Inconsistent Policy Regarding The Sale Of Apollo Era Items, earlier post\n\n\"It should be abundantly clear by now that the NASA IG and General Counsel offices have no consistent policy whatsoever when it comes to selling historic Apollo era artifacts. In some cases you can sell pieces of the Moon, and in other cases you cannot. In some cases you can sell items used during Apollo missions, in other cases, you cannot. And of course, it is also acceptable practice to rough up little old ladies and threaten lawsuits against elderly former astronauts.\"
This page contains a single entry by Keith Cowing published on September 20, 2012 2:10 PM. 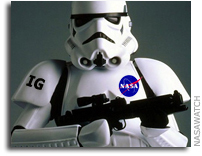 Charlie Bolden Doesn't Want Anyone to Criticize NASA was the previous entry in this blog. Details on NASA's Latest Mars Plan Next Week is the next entry in this blog.